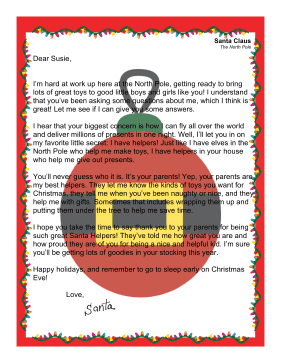 Encourage children to appreciate their parents in this letter from Santa that names moms and dads as special Christmas helpers. I'm hard at work up here at the North Pole, getting ready to bring lots of great toys to good little boys and girls like you! I understand that you've been asking some questions about me, which I think is great! Let me see if I can give you some answers. I hear that your biggest concern is how I can fly all over the world and deliver millions of presents in one night. Well, I'll let you in on my favorite little secret: I have helpers! Just like I have elves in the North Pole who help me make toys, I have helpers in your house who help me give out presents. You'll never guess who it is. It's your parents! Yep, your parents are my best helpers. They let me know the kinds of toys you want for Christmas, they tell me when you've been naughty or nice, and they help me with gifts. Sometimes that includes wrapping them up and putting them under the tree to help me save time. I hope you take the time to say thank you to your parents for being such great Santa Helpers! They've told me how great you are and how proud they are of you for being a nice and helpful kid. I'm sure you'll be getting lots of goodies in your stocking this year. Happy holidays, and remember to go to sleep early on Christmas Eve!